Heading into my Reading Captain training, I didn’t know what to expect. I had wanted to get involved in my community by doing something that I could fit into my busy schedule. The Reading Captain training introduced me to information, resources, and messages that could be easily shared with others. I don’t have children of my own, but there are lots of kids in my life, so I was super excited to share these gems of information. After the training, I realized I was constantly talking about what I learned. I’m a talker! Most importantly, I shared the challenges and reasons why it’s so important for kids to read on grade-level by fourth grade. This snowballed into people wanting to donate books and connect me with other people who were interested in literacy. By having conversations with community members, I was able to see that different neighborhoods in our city have different access to resources. I could see that affluent neighborhoods had new, diverse books in their free book nooks, while my neighborhood was relying on older and often outdated books. As a volunteer Reading Captain, I wanted to use my position to bring light to these disparities, share this information with those with resources, highlight the strength in my Whitman neighborhood in South Philly, and bring people together to address these issues. Before I knew it, I was really getting into it! 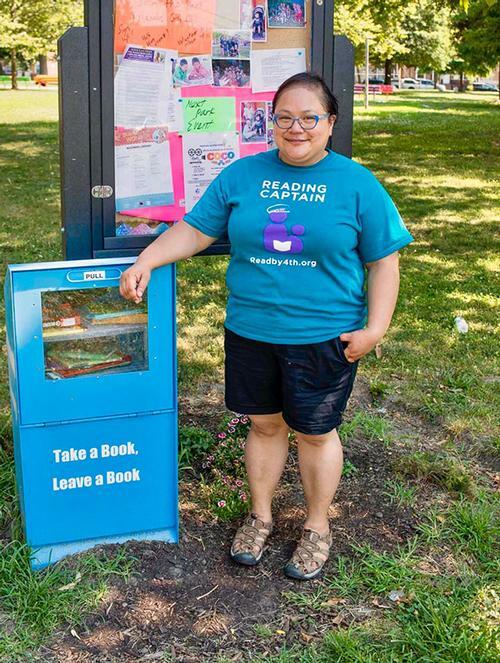 With my involvement with the Friends of Mifflin Square, I was able to coordinate with Reading Recycled, and get a recycled newspaper-bin-turned-sidewalk-library installed in the park. I use the donations I receive to keep it stocked, but find that the community has also been active in taking care of it! I have placed book nooks in various community organizations and businesses around the Whitman community. I'm active in the South Philly Reading Captain group by bringing people and organizations together and finding ways for us to spread our message. I’ve attended trainings to conduct workshops for parents, and turned around to volunteer to do monthly workshops at the Whitman Library. Coming into being a Reading Captain, my focus had been on public and mental health, but this program helped me find another way to participate in community organizing about a topic that touches each of us – literacy for all. Reading Captains are individuals who understand the importance of reading and are passionate about doing more for families. 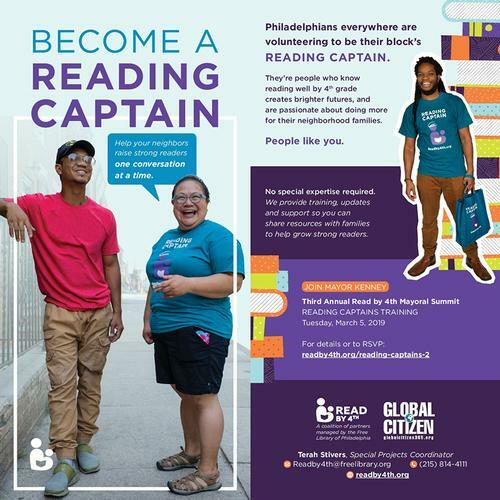 Through the Reading Captains initiative, Read by 4th, Philadelphia’s literacy campaign, aims to place a literacy resource leader on each neighborhood block in the city. You can get trained to become the literacy resource on your block by attending the upcoming Read by 4th Mayoral Summit on March 5! At this cocktail reception and dinner, you will get to learn more about Read by 4th, hear from Mayor Kenney about the important role Reading Captains have in the success of the campaign, get free Reading Captains gear and complete the short training. Sign up today! 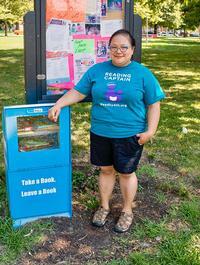 Erme C. Maula, Read by 4th Reading Captain, and the recycled newspaper-bin-turned-sidewalk-library installed in her neighborhood park. Erme reaches out to her neighbors in her community. Become a Reading Captain today! Add a Comment to Checking in with a Read by 4th Reading Captain!